March Madness | Have You Finished Your Bracket? March Madness is upon us. I wait for the NCAA’s every year, and once it is over, I go through serious withdrawals until next year. I have completed my picks – but this year was quite different for me… I did a lot of guessing. My bracket is below. 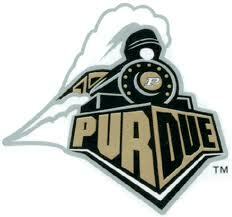 Having been born and raised in Indiana and graduating from Purdue, basketball is in my blood. I attended Purdue from 1982 through 1994 (yeah, I was on the long-term plan), and rarely did I ever miss a basketball game. Lower arena, wearing Purdue garb, and program in hand to keep the stats (it helped to keep me somewhat calm – otherwise I would be out of control). This past season was very unlike me… I watched very little basketball, and did not kept up on any of the conferences, which is very abnormal for me. Just been so busy on the internet this year, I suppose. My new addiction… blogging. So…. a lot of guessing went into play. Sure, I could look up each and every school, check the records, review the top players, the trends, etc., but there isn’t enough time. Hell, the years which I have done that much work in the past seem to be the years I failed miserably with my picks. Speaking of Purdue basketball… I have to share a little story with you about my date with a Purdue basketball player. Year: 1984. Player: 7’0″ Joe Gampfer. As tall as a tree, but not much grace. But then, how many people that tall have grace? According to the articles I found online, he had a very strong senior year in high school, but at Purdue, he was known for blocking the ball at the basket merely by just raising up his arms. Tall son-of-a-gun. If I recall correctly, Joe wore a size 21 shoe – his feet were enormous! (Don’t go there! I have no idea.) It was a one-time date. Dinner, and that was pretty much about it. Personality-wise, he was most definitely not a match for me. But I’ll never forget when he arrived to pick up me. Here is this gigantic man, towering above everyone else typically by a foot, and he drove up in a Chevette (or something similar to a Chevette). When we got in the car, it was all I could do to keep from laughing. He had his seat all the way back, naturally, but his knees were still up next to his ears! I tried to find a picture of and info about Joe, but there is very little in the Purdue archives that far back – and that makes me feel so old. 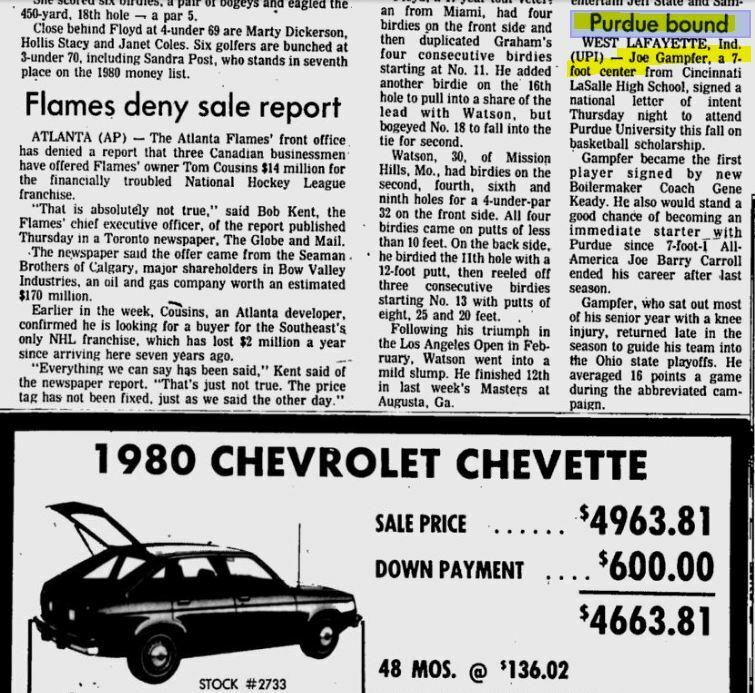 Best I could do was a blurb in a local paper about Joe choosing Purdue – and note the Chevette ad just below… funny coincidence. 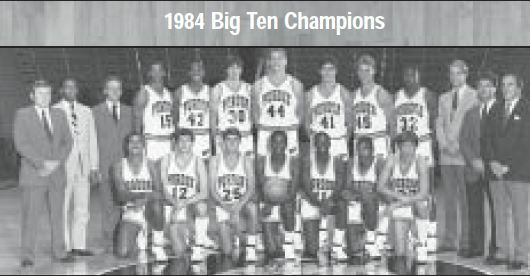 And found the team photo from 1984 when the won the Big 10 Championship. 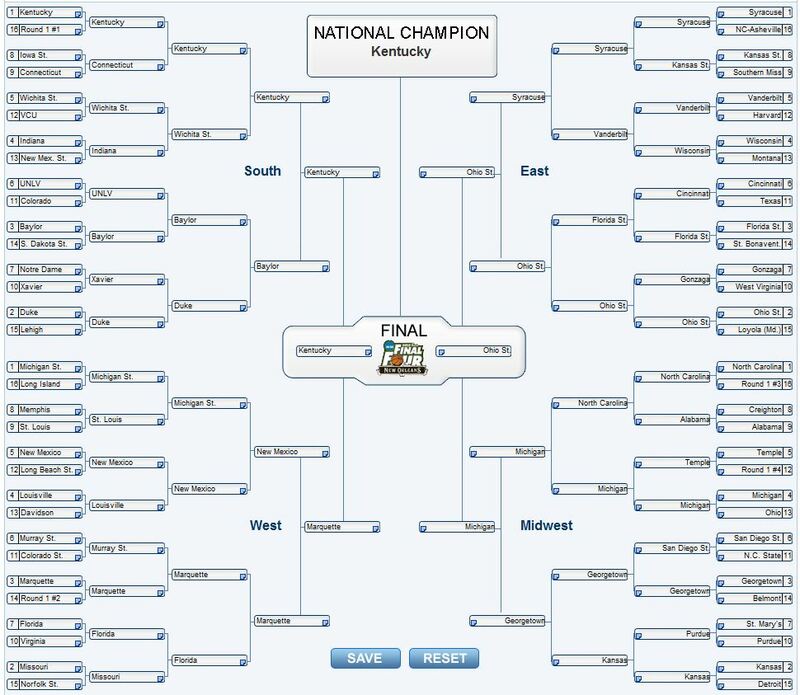 Also, click HERE to view a bracket with the 64 teams as well as the date and time they play in the first round. Or you may scroll down to the bottom to view. 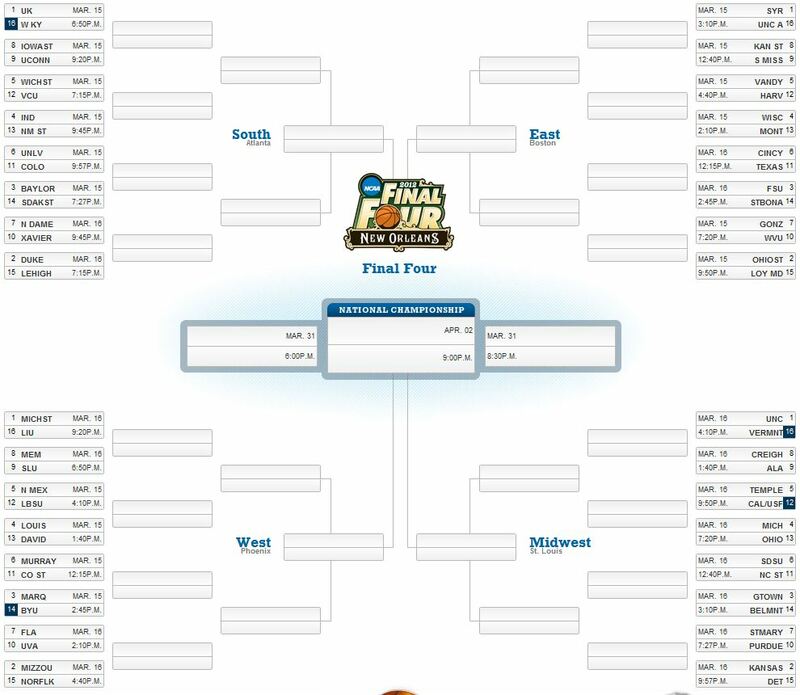 NCAA March Madness Men’s Basketball 2012 Bracket with all 64 teams including date and time of First round play. Click on the image to enlarge. Gah – basketball fan. I meant basketball. Joe Gampfer lived on the same floor as I did during my freshman year at Purdue. He wasn’t a great student or basketball player, but he was quite talented as an artist and really funny. He was always hounding the cafeteria people for more food. Eventually, Gene Keady cut him, supposedly for weight issues, which I can understand. He did get to keep his scholarship though. I knew him pretty well. I will still never forget how he literally folded his body to get in the driver’s seat of his car. I still remember what I ordered for dinner… BBQ ribs. We were at a BBQ restaurant where everyone threw peanuts on the floor. I don’t remember the name of it. Too many years ago. Thanks for sharing!! It’s funny. He doesn’t remember you at all. Amazing how you can just say anything about anyone on the internet. He doesn’t remember you and looks like you haven’t aged well so glad it didn’t work out lol. So many falsehoods stated here…almost like you didn’t know him at all. Never owned a chevette, hated bbq, and didn’t play his Sr year due to injury. Find something real to blog about. I wouldn’t expect him to remember me. We only went on one date. Joe, on the other hand, is a person you don’t easily forget. Truthfully, I don’t remember if it was a Chevette, but it was a small car similar to a Chevette. I didn’t say we went for BBQ — I ordered BBQ ribs. We went to one of those restaurants where you throw peanut shells on the floor. It’s long since closed and I cannot recall the name. And what does his Sr year have to do with this? It was school year 1983-1984 (I think spring of 1984) when we went out. He was playing (or had played) that school year. Why are you getting your nose all out of joint? 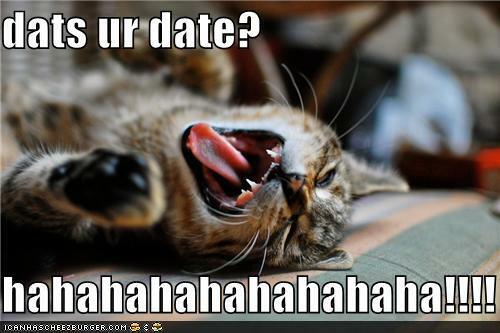 Everyone goes on dates in college. So what? He happened to be a 7’+ bball college player but didn’t become famous so it’s not like I’m trying to impress anyone. If I was, I certainly would have embellished the date, not say it was an “okay” date. And you think I haven’t aged well? First of all, do you have a picture of me in my younger days to compare to? If so, I’d like a copy, please. I have lost all my college photos. And it’s really too bad that you judge people by their looks and whether they’ve aged well or not. You are obviously a miserable, hateful person. Best of luck to ya. Hope you figure life out before your time runs out. I had the pleasure of meeting ‘Big Joe’ two weeks ago. He runs his own Limo and transportation service in Cinn area (and is quite good). Great guy. Oh yeah? Well, good for him. Hope he is well and happy. Thanks for the update! Played basketball with Joe from grade school through high school. Joe should have never gone to Purdue when Rose left. Keady was not the coach for him. Keady did take his scholarship away. Yeah? I didn’t realize that. Thanks for the update on Joe. Hope he is doing well.